Mount of Jupiter: while reading palm it is really very important to observe the Mount of Jupiter as it is related to Educational achievements, honors, Spirituality, Government Services, leadership, organization and Authority and willingness. It plays a very special role in success of any individual in his or her work field. In Indian astrology Jupiter is known as the GURU because it is a benevolent planet, And considered as a very auspicious planet. 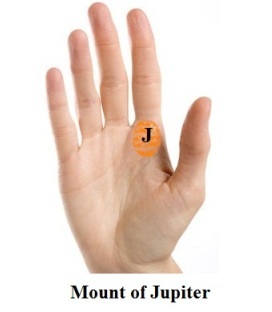 Mount of Guru (Jupiter) can be located at the base of index finger of any person. They will become really very religious minded and most of the time they would try to help others for the betterment of the society. They always start with great confidence and always success. They get easily respected and recognized by the society because of their polite and helpful nature. They will have high self respect for them self. Without getting disturbed in any condition. If the mount of Jupiter is less developed, or underdeveloped, than it makes a person physically ordinary, healthy and have a smiling face. They will be expert in reading and public speaking. They will be more interested towards respect rather than wealth. With soft hearted and always love nature. And will have their special qualities of authority and leadership which will get them success in their life easily. If the mount of Jupiter is overdeveloped on any person’s palm than it indicates, his selfish attitude, proud nature and difficulties in success. In absence of the Mount of Jupiter the person will always desire for self respect. Person will have very low ideas and belong to a lower category and always get difficulties life. If the mount of Jupiter is well developed and the fingers are pointed than such people becomes very superstitious. As we would advise, carefully observe all the unseen sings before any analyze, to get the accurate reading.